*Sarah Michaud, director of the Drug and Alcohol Resource Center, was quoted in a Feb. 27story that appeared today in the New Haven Register about the prevalence of ecstasy and similar drugs on college campuses. Sarah noted that there have not been any reported cases recently of overdosing on these kinds of drugs at Southern. *For those of you who were unable to see the story last night on Channel 8, health reporter Jocelyn Maminta put together a nice segment about the new high-tech treadmill obtained by the Human Performance Lab that is able to generate 3-D gait analyses of runners. Bob Gregory, assistant professor of exercise science, was interviewed about the equipment and how it works.Bob Axtell, professor of exercise science, also was interviewed after using the treadmill himself. *Jim Barber, director of community engagement and former long-time track coach at Southern, was featured in the Hartford Courant on Feb. 22 in the newly created “Hometown Heroes” section. The article talks about his lifetime of service to the university and to the New Haven community. Jim began working at Southern in 1967. *Greg Paveza, dean of the School of Graduate Studies, was interviewed Feb. 22 on the Channel 30 morning newscast. He spoke, along with Greater New Haven Chamber of Commerce President Tony Rescigno, about the future of health care in Connecticut. *You won’t see the works of Aristotle being discussed on TV newscasts very often. But Chelsea Harry, assistant professor of philosophy, was interviewed on that very subject Feb. 15 onChannel 30’s Sunday morning newscast. Chelsea discussed her research of how Aristotle appears to have endorsed the theory that dogs and other small animals have a limited concept of time. Modern science is debating that subject today, but there seems to be growing evidence that this is the case. Jackson, Chelsea’s golden retriever/German shepherd mix, accompanied her on the air. *Carmen Martell, who participated in December’s graduation ceremony at Southern after earning an M.S.N. degree, was featured Feb. 2 as the cover story in the Woman section of theWaterbury Republican-American. Her story is compelling as someone who grew up in a series of foster homes and was on her own as a teen, but later overcame that tough early life to become a nurse. *The New Haven Register ran an article on Feb. 2 that included an announcement about the upcoming citizens’ police academy at Southern. *Lesley Wolk, associate professor of communication disorders, was interviewed Feb. 1 onChannel 30’s Sunday morning newscast about the cultural phenomenon of “vocal fry.” She talked about the increasing use of a voice inflection in which a person opts to talk in a deep, gravelly tone. She noted that high school girls and young women seem to use this way of talking the most and the “fry” is generally done at the end of sentences. As we are all well aware of by now, we have been experiencing some extremely cold temperatures. In order to protect our facilities and ultimately faculty and staff personal space, we need your help in making sure all windows are closed in offices and classrooms. Since many of our buildings have units located on outside walls, it is extremely important to make sure windows are closed so piping won’t freeze. Last weekend we found several windows open in both classrooms and offices. Had we not been on Campus doing snow removal these areas might not have been discovered and frozen pipes could very well have caused serious water damage. Please take a moment to check for open windows in your areas, and thank you for your assistance. It turns out that George Lucas might have inadvertently crossed the line between science fiction and science when he created the planet Tatooine in the iconic “Star Wars” saga. 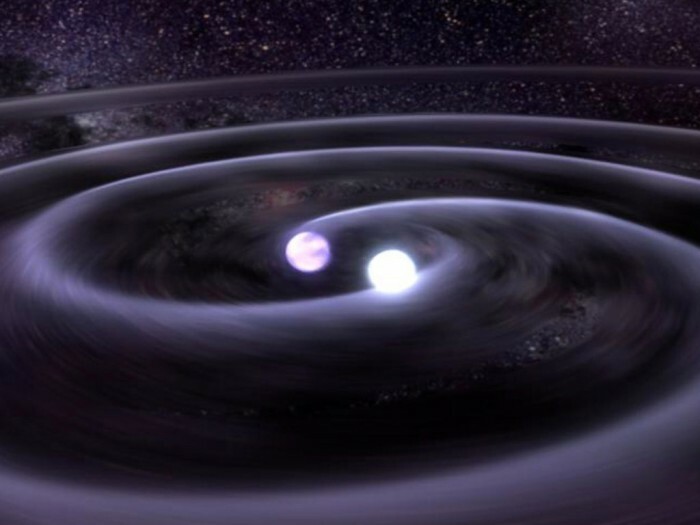 While the concept of a planet orbiting two suns was intended to be fictional, modern astronomy has found that such planets actually do exist in the cosmos. The Kepler mission – whose aim is to find Earth-like planets in parts of the Milky Way Galaxy – recently discovered that 40 to 50 percent of these bodies are actually part of binary solar systems. In other words, those planets are part of solar systems with two suns, rather than one. The team of scientists that made this finding was led by Elliott Horch, professor of physics at Southern. “Most of these planets are probably not like Tatooine, where the planet orbits twin suns that are close together. They generally orbit only one of the two stars, with the second star slowly orbiting the system at a much greater distance,” Horch says. But Horch concedes that at least a small percentage of the Earth-like planets in these binary solar systems do orbit two suns. In some cases, that could result in planets having constant or near constant daylight. Nevertheless, even for the large majority of planets that only orbit one of the two suns, their nighttime skies could be brighter than ours. “This would mean that during the day on the exoplanet, the closer sun would dominate, but at night there would be an especially bright star — a night sun — that hangs in the sky,” Horch says. If nothing else, it might eliminate the need on these planets for daylight savings time to give children some light while waiting for the school buses in the morning. Horch developed the Differential Speckle Survey Instrument (DSSI) several years ago for the National Science Foundation. The telescopic device provides astronomers with stunningly crisp images of outer space, and is being used by the Kepler mission. He is currently developing a portable multi-channel intensity interferometer, which essentially is a double-barrel telescope that would generate ultra-high resolutions with even more detailed information about celestial bodies. Construction of this new device, like DSSI, is being funded by the NSF. President Papazian will host a University Dialogue on Tuesday, March 3 at 12:30 p.m. in the Adanti Student Center Theater. Please join the President and members of her Cabinet to discuss issues of interest to the campus community. The U.S. Forest Service uses it to help fight fires, build trails, and protect wildlife. Fast-food chains rely on it to track sales and predict the most profitable sites to build new restaurants. Electric companies depend on it to shorten the duration of power outages and improve response times. Welcome to the expanding field of Geospatial Information Science (GIS), in which state-of-the-art technology — including the global positioning system (GPS), remote sensing, and geographic information systems — is used to gather information related to the Earth’s surface and then combine it with social, economic, environmental, and other data. Experts in the field gather, store, analyze, and use the information extensively in research, business, government, nonprofit organizations, and more. “GIS and geospatial technology are used almost everywhere — from forestry to marketing to public health. The opportunities and possibilities are vast,” says Eric S. West, associate professor of geography, who spoke to students about the field and Southern’s new minor in Geospatial Information Science and Technology. Launched in the fall 2014 semester, the minor requires the completion of 18 credits. 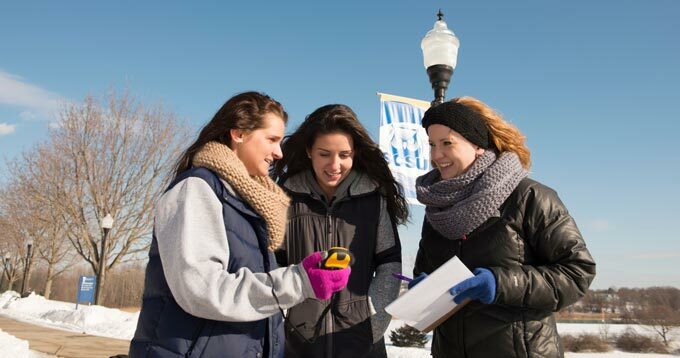 Students take two core courses — “Maps and Map Making Technology” and “Introduction to GIS” — and complete a minimum of seven credits, choosing from electives such as “Remote Sensing” and “Cartography.” A capstone experience — a culminating course and/or an internship — furthers students’ knowledge. Southern formally celebrated the introduction of the minor on GIS Day, held on November 19. Students from numerous majors enjoyed presentations from two alumni, who discussed how maps and geographic information systems are used at their organizations: Ethan Hutchings, ’08, manager of operations for the city of New Haven’s Transportation Department, and Marwin Gonzalez, ’08, the GIS project manager at New England GeoSystems (NEGEO). Both majored in geography and studied with West. “If you start to think spatially, you open up your world tremendously,” says Gonzalez. In addition to working at NEGEO where he conducts GIS projects for municipalities and regional planning agencies, Gonzalez is a marketing GIS coordinator for LEGO KidsFest and teaches at Central Connecticut State University. “I challenge my students to give me a field or career that does not use GPS,” he says. During his presentation, he highlighted numerous real-life applications for geospatial information science and technology. Examples include determining the amount of sand needed by a city snowplow driver and creating ways to securely store maps and other data for city water systems. He notes that the latter is critical in light of terrorism concerns. The outlook for those employed in the field is bright, with an average salary of $82,340 in 2013, according to the Bureau of Labor Statistics. Alumnus Ethan Hutchings parlayed a successful internship obtained with the assistance of Associate Professor of Geography C. Patrick Heidkamp into a career with the city of New Haven. Hutchings initially attended the University of Maine, majoring in forestry and wildlife. The fit wasn’t ideal, and he left school and ultimately traveled across the U.S. and internationally, visiting Nicaragua, Costa Rica, and Vietnam. When he later took an introductory geography course at Gateway College, he knew he had found his niche and transferred to Southern where he completed his B.S. in geography. Saturn (pictured above) is known for its rings, but another planet more than 400 light years away is believed to have rings that are 200 times as large. Photo courtesy of NASA/JPL/Space Science Institute. Astronomers recently discovered what appears to be a young giant planet with breathtaking rings in a distant solar system more than 400 light years away from Earth. Their findings have just been accepted for publication in the prestigious Astrophysical Journal. The astronomers – the University of Rochester’s Eric Mamejek and the Leiden Observatory’s (The Netherlands) Matthew Kenworthy – say the three dozen or so rings span nearly 120 kilometers – roughly 200 times the size of Saturn’s. The planet – referred to as J1407b – has a mass estimated at between 10 and 40 times that of Jupiter, which is the heaviest planet in our solar system. The discovery has caught the attention of Elliott Horch, a noted astronomer and professor of physics at Southern. “This is another signpost along the journey that is going on in astronomy right now in the area of exoplanets – planets that orbit other stars besides the Sun,” he says. “How diverse the menagerie of planets that we know about is becoming! Indeed, astronomers say that if Saturn had rings of the magnitude of planet J1407b, they would be visible with the naked eye in our nighttime sky. In fact, the rings would appear larger than the moon, despite being much further away from Earth. The findings indicate there are gaps between some of planet J1407b’s rings, leading to a theory that moons have been formed from the rings, just as it is believed that many of Saturn’s 60 or so moons were created this way. Astronomers believe Saturn’s rings were also much larger early in its own life, before some of the material from the rings left to form moons. Astronomers say that while Saturn’s rings are composed of ice, J1407b has rings probably made of dust since the planet’s temperature is believed to be far too hot to have ice rings. Saturn, which has been around for about 4.5 billion years, is an old timer compared with the relatively youthful J1407b – a planet for a mere 16 million years or so. Hey Saturn, maybe you can take the newbie under your wing…er, ring.